Journalism’s classic format of five Ws and an H is a great way to organize information by answering fundamental questions about a subject. This format’s beauty lies in its simplicity, and we use it here to offer you a bird’s-eye view of BioFables. The words in red will link to pages that dig deeper into the details of the six questions and will be live shortly. Who are BioFables’ main characters? Who are BioFables’ intended readers? The main BioFables characters are the 7-year-old twins Melody and her brother Mallory, their parents, and their grandfather (their father’s father). BioFables children’s books are designed for children 7-12. These young readers depend on older siblings and adults for their reading material. The stories appeal to the whole spectrum of readers: parents, teachers, and the general population. Adults are the primary focus of the Companion Books and this website (see the section What). What does BioFables offer to readers? Science and humanities-based mini lessons, interwoven throughout the children’s stories; Companion Books for mentors, including parents and teachers. 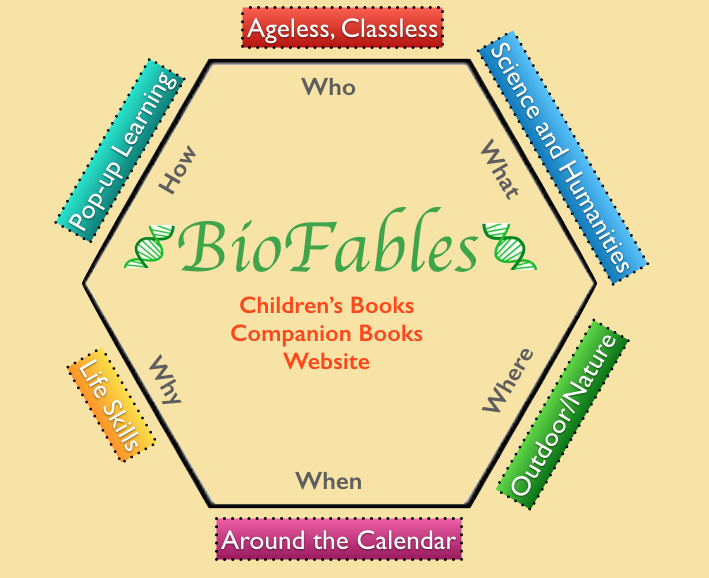 This website: brief introductions to each book, including tables with links to external sources, for parents, teachers, and other adults interested in playing an active role in developing the next generation’s academic achievement and success in life; BioBlog, written by BioFables characters. Where do BioFables stories take place? Mostly outdoors, in natural settings, mostly in the U.S. midwest (with a couple of exceptions), including the family’s own back yard. Getting out in nature offers a healthy couterbalance to indoor, especially screen-based, activities. The stories involve plenty of physical exercise and mental challenges that accompany visiting new places and encountering new experiences. When do BioFables stories take place? Every month of the year. Different seasons offer their own unique ambience,flavor, and even challenges. The time is the present, the stories focused on acquiring knowledge from nature and everyday experiences, rather than from electronic accessories. Why read BioFables? Plenty of examples of the initial five main characters, spanning three generations, learning from each other. Seven-year-old twins Melody and her brother, Mallory, are the main beneficiaries of most of the learning as passed down from Grandpa Mike and from their parents. How does BioFables make worthwhile reading? Fun tidbits of biology, chemistry and other science along with history, arts and other humanities pop up naturally throughout the stories. Children and their mentors who want to explore these ideas further will find a wealth of resources in the links, organized by topic for each chapter in every book.